Database Systems Corp. (DSC) is a leading provider of computer telephony integration (CTI) phone systems and call processing software solutions. DSC provides our clients with phone software that connects our own standalone phone application or their existing programs with our state-of-the-art phone systems using sophisticated computer telephony software and hardware. This connection is often referred to as a computer phone. What Is A Computer Phone? "A computer phone is computer telephony software and hardware that enables a desktop, laptop or workstation computer to perform typical office and call center telephone functions. In this environment, a computer network functions as the medium for transmitting both voice signals and digital information. Users of this technology are equipped with a headset or a hand-held device and use the numbers on the keyboard for dialing. 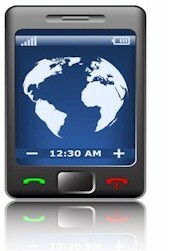 The computer phone software can perform the full range of telephone features available through traditional phone systems including such functions as teleconferencing and call forwarding. A computer phone may utilize the computer's sound card for audio input and output, but typically the computer phone relies on voice signals transmitted through a headset. Computer phones are typically used in call centers and other businesses that rely heavily on a combination of computers and telephones." The DSC computer phone connects your computer applications with our PACER (digital) and WIZARD (analog) series of phone systems. PLUS we provide extensive reports, statistics, and graphs to help you effectively manage the operation of your phone system and application. Our computer phone functions on your local area network (LAN) or over the Internet, enabling your employees to work either in your corporate offices, satellite remote offices or from home. Contact DSC to learn more about our computer phone systems and phone applications. Our computer phone software is a rich set of computer telephony software library routines that enable application programs to communicate with our phone system. This comprehensive softphone software lets you increase employee productivity, enhance customer service and reduce costs by combining the capabilities of our robust phone system with the custom functionality of your Windows, Unix or Web applications. Calls can be accepted by the phone system and distributed in an intelligent fashion to your phone agents using our automatic call distribution (ACD) and IVR software. Calls are routed to available agents based upon DNIS (Dialed Number), ANI (Caller ID), or information entered by the caller in our IVR system. Our phone systems support both analog (Wizard Series) and digital (Pacer Series) phone lines and can be configured from 1 analog line to a 1000 digital lines. Inbound Call Answering System - The DSC computer phone system processes inbound phone calls and routes these calls using our ACD (Automatic Call Distribution) system. With our IVR (Interactive Voice Response) system, callers can perform self-help functions without speaking with an individual by making simple selections using the keypad on their phone set. Our phone system can even connect calls to your employees who are working at home or in remote offices. Outbound Auto Dialer - Our DSC computer phone system is also capable of performing outbound calling functions including voice broadcasting, dial on demand, predictive dialing, progressive dialing, and preview dialing - all at the same time. Blended Call Center Phone Operations - The DSC computer phone system is capable of performing both inbound and outbound calling functions simultaneously. This blended call capability makes our phone system ideal for call centers. Contact DSC for a FREE analysis and quote and to learn more about our computer telephony phone dialers.